Lock in a great price for Kokai Resort – rated 8 by recent guests! Perfect centric location. Very friendly, smilling and helpful staff. The room was clean and well organized. Comfortable bed and clean bathroom with hot water! We were very happy to spend our past days in that hostel! Staff is great. The owner really took care of us when we could not get cash from the nearest atm. The room is quite big and has a porch where you can just sit out. Everything you need, nothing you don’t. The staff is so nice here. It’s like a family. Very chill place. The location is perfect for me, very accessible & near to a lot of restaurants, carenderias & bars in GL. There are a lot of hammocks in the veranda & common area, so comfy. Kokai is really worth the money. We stayed in the dorm type room which has it's own toilet and shower room, cabinet, drawer, wifi. 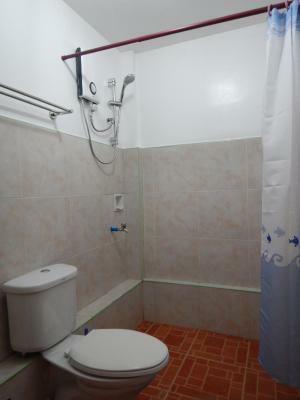 The place is in General Luna so it is near to everything (market, party place and restos). Transportation is also accessible so there's no problem going around Siargao from Kokai. The staffs are all friendly and welcoming. They helped us during our stay. Also, the place is near the beach so you can just relax and unwind there. The property was located in an area where everything is accessible. Close enough to the beach and the road.The staff was nice though. They really do their best to please their guests. No thanks to the owner. Kokai Resort This rating is a reflection of how the property compares to the industry standard when it comes to price, facilities and services available. It's based on a self-evaluation by the property. Use this rating to help choose your stay! One of our best sellers in General Luna! Nestled within private gardens and offering barbecue facilities, Kokai Resort is located 150 feet away from the General Luna lagoon in the Siargao Island Region. The property has a sun terrace and views of the garden, and guests can enjoy a meal at the restaurant. Kokai Resort features free WiFi and serves up a variety of local and international cuisine. Guests can take part in various types of water sports activities at an additional charge. Motorbike hire is also available. When would you like to stay at Kokai Resort? This native-style bungalow features a private entrance and terrace, 1 double bed, air conditioning, a hammock and shared bathroom facilities. This duplex bungalow features a private entrance and terrace, 1 double bed, air conditioning, wooden flooring and private bathroom with hot/cold shower. The resort is located in a lush garden 50 meters away from the beautiful lagoon of General Luna. Ideal place for water sport activities or just chill out. We do offer 5 different accommodations made in a native style and on a cozy way . The lagoon a easy to access ideal for SUP , kite surf do some surfing or just relax depend on the element condition. House Rules Kokai Resort takes special requests – add in the next step! Please note that guests may settle payment via PayPal. Please inform Kokai Resort of your expected arrival time in advance. You can use the Special Requests box when booking, or contact the property directly using the contact details in your confirmation. the attitude of the lady owner towards her employees. Expensive cottage with shared bathroom. Bathroom was barely cleaned and had a sewer smell. For 1800 pesos that's too much. Location is ok, close to all the popular restaurants and bars. But around the resort is all construction sight. I was so happy with this Hostel/Resort and the staff are so happy and welcoming. They knew everyone by their first name. The dorm at this hostel is so comfortable and very cool at night. I found it very easy to meet people here as the common area is very pleasant. Would like to thank all the staff especially Teresa and Am for being so helpful and kind. Will be back for sure! Wifi could have been better in the private bungalow. But not a dealbreaker. Very friendly staf. Hot water! Great emplacement, near Cloid 9, many restaurants around, beach. Easy tonrent a motorbike. Staff are friendly and fun to talk. Amazing staff, friendly and helpful, and perfect location! They took my towel because they thought its theirs and didn’t find it after I asked for it. Starting the early morning there are construction work, really noisy and wasn’t mentioned. The cost was way to Much for the condition: water pressure most of the time is low, water not always hot.. At the same price our friend had a room with hot water and clean place while we were in a dorm (16 mixed beds). Wifi doesn’t really work, only at night (like 2:00-5:00 am) it was fine. A lot of spiders on sealing of the bathrooms. Water on our shower is so soft that we can hardly finish bath quickly. Bedsheets and pillow cover doesn't smell that it was washed. I like the structural design of the cottage.